When Elizabeth Taylor married Richard Burton for the first time after a tumultuous affair on the set of Cleopatra she chose as her wedding gown a canary yellow chiffon dress. Designed by Cleopatra costume designer Irene Sharaff, Taylor paired the dress with hyacinths and lilies of the valley woven into her hair, which was plaited into a chunky braid down her back and dotted with yellow ribbon bows to match the colour of the dress. You can read the full story of Taylor ad Burton’s love affair and the worldwide scandal it caused here. Being Elizabeth Taylor she of course had to add some beautiful jewellery, and wore a large Bulgari emerald and diamond brooch (18.61 carats no less) which was a proposal present from Burton. Taylor married eight times (including twice to Richard Burton), and this was wedding number 5. You can see more photos of Taylor’s many beautiful wedding dresses in my Pinterest gallery below! 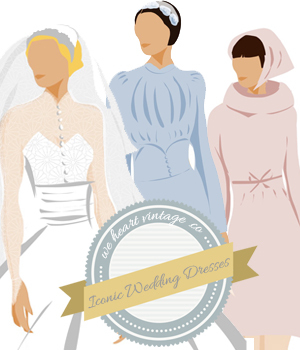 Follow We Heart Vintage’s board Elizabeth Taylor’s wedding dresses on Pinterest. I remember Mum’s comment on seeing this on the news at the time: re the hydrangeas & lily of the valley in her hair “she must smell like an air freshener”! Ha ha. I think she was probably right! I always thought those flowers were a bit over-the-top, but then again Elizabeth Taylor wasn’t a woman to do things by halves was she!